Highly versatile focal length equivalent to 35mm (in the 35mm film format), covering a range of subjects from snapshots to landscapes and portraits. 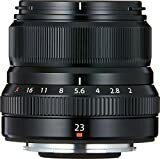 The XF23mmF2 R WR is a wide-angle lens with advanced image resolution, capable of drawing out the full performance of Fujifilm’s proprietary X-Trans CMOS sensor. It has a similar size and design flair of the existing XF35mmF2 R WR, to make up a stylish collection of compact lenses. The inner-focus AF system uses a stepping motor* to drive the focusing group of lens elements for silent and fast autofocus. This entry was posted in Discount Photography and tagged Angle, Black, Fujifilm, Fujinon, lens, Wide, XF23 by Ball Photo. Bookmark the permalink.